Rwanda will stage the biggest sports event in its history when the fourth edition of the African Nations Championship (CHAN) begins in Kigali on Saturday. The country hosted the 2009 African Under-20 Championship, with eight teams participating and all of the games being played in the capital. But the 2016 CHAN involves 16 teams in three cities - as well as Kigali, games will be played in Gisenyi in the west and Butare in the south. About $21m has been spent by Rwanda's government on upgrading facilities and other preparations. The tournament is a continental championship for home-based players, making it wide open and difficult to predict - the 2014 winners, Libya, and runners-up, Ghana, both failed to qualify for this edition. One of the aims of the tournament is to give those who play in their own domestic leagues a chance to showcase their talent. After the 2014 tournament, seven members of the Zimbabwe squad were signed by clubs outside the country, mostly in South Africa. 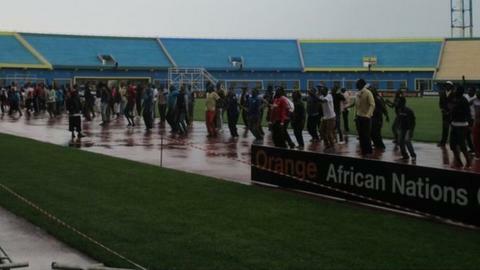 Hosts Rwanda have been performing well in the run-up to the tournament under British coach Jonathan McKinstry. They were runners-up at the Cecafa Cup last November and beat DR Congo 1-0 in their final friendly. Ivory Coast are the reigning Africa Cup of Nations champions, but that was with a squad that had only one home-based player, so they are in an entirely different situation. The Elephants are making a third appearance at this tournament, and have yet to get beyond the group stage. Morocco were quarter-finalists on their debut appearance in 2014. Their strength in continental club football means that they deserve respect, and they were unbeaten in four matches in qualifying for this tournament. Gabon coach Stephane Bounguendz says that his team is aiming to win the competition, after reaching the quarter-finals in 2014. "We are hungry to make the people in Gabon happy," he told BBC Sport after a 1-1 draw in a friendly away to Uganda. The strength of the league in DR Congo has helped them to qualify for all four editions of CHAN and to win the inaugural tournament. The Leopards are again among the leading contenders, with eight players from 2014 Champions League runners-up AS Vita Club, and three players from 2015 Champions League winners TP Mazembe in the squad. Many would say that Cameroon are under-performing at club level and national team level. Indomitable Lions coach Alexandre Belinga had only one home-based player in his squad for the second-round tie of the 2018 World Cup qualifiers against Niger, and the ability of the home-based players will come under scrutiny at this tournament. Angola were runners-up in the 2011 tournament, losing 3-0 to Tunisia in the final, and this is only their second appearance at CHAN. The fact that their representatives last in African club competition went out in the early rounds is not a good sign, but they could be dark horses in Rwanda. Ethiopia qualified for the 2013 Africa Cup of Nations finals with a squad of mostly home-based players, but their fortunes have taken a dip since then. The 2011 winners Tunisia are at the finals for a second time and must be considered among the strongest contenders. Etoile Du Sahel, Esperance and CS Sfaxien all played in the group stage of last year's Confederation Cup, and players from those clubs make up the majority of Tunisia's squad. Nigeria must also be among the favourites, having finished third at the 2014 finals in South Africa. Coach Sunday Oliseh has a squad of mostly young players, who will be eager to impress the coach and the scouts at the tournament. Guinea knocked out Senegal to qualify for the first time but will be tested here. Niger were quarter-finalists in 2011 but find themselves in what looks to be a difficult group. Zambia have 2012 Nations Cup winners Christopher Katongo and Isaac Chansa in their squad. They missed the last two editions of the tournament and have prepared well with some good performances in friendly matches. Zimbabwe have played at all four editions of the tournament, finishing fourth in 2014. Coach Kalisto Pasuwa has yet to lose with the Warriors in six games in charge. Captain Hardlife Zvirekwi believes that the opening game against Zambia is likely to define their tournament. "We have to set the tone by winning against Zambia - the game is so important for us," he said. Mali lost to Zimbabwe in the quarter-finals in 2014 and make a third appearance at the finals. Their physical strength is always an asset and the Eagles have a chance of going further this time. Uganda cannot be ruled out, but they were eliminated at the group stage last time and find themselves in a tough group.